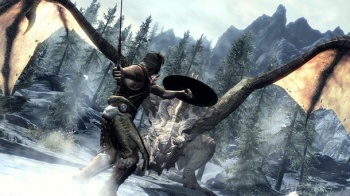 Bethesda is currently testing the Skyrim 1.4 patch on all three platforms, while the Creation Kit and Steam Workshop should be ready for public launch by the end of the month. Whether you love it or hate it, there's one thing about Skyrim we can all agree on: it's a mess. It's not as much of a mess as it was on launch day but in the finest tradition of Bethesda open-world RPGs, after three major updates it's still riddled with bugs. Props to the team for not giving up, though, as the 1.4 patch is in the pipe and just about ready to bring us a whole pile of fixes. The update is currently in testing, with hopes that it will be finalized and submitted to Microsoft and Sony for certification next week. The PC update will be released as optional beta versions through Steam as an "extra safety check" before it's rolled out to everyone; further details on how exactly that system will work should be revealed soon. The Creation Kit and Steam Workshop are also just about ready for a public release that's expected to happen sometime near the end of the month. That's a lot of good stuff. "Echoing what we said back in December, we'll continue to look into issues that are being reported and subsequent updates will follow," Bethesda said. "You have all supported Skyrim in a huge way, and we'll be supporting all of you, and continue to make the game better."